Crank is back from the machinist, it only required a polishing - a little surprising with 160k miles. Here, the bottom end is all ready to go back together. 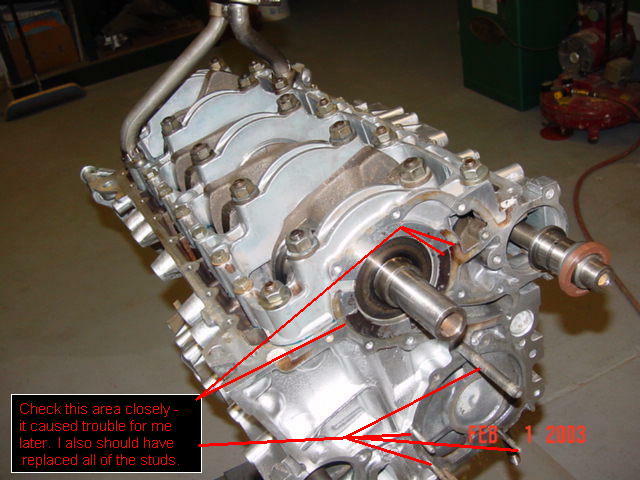 Side note: Installing the crankshaft girdle should be done with great procedural care. Generally, the girdle should be coated with sealant, put in place, lightly torqued and then tapped with a hammer. The objective is to get the forward face surfaces to be near flush. 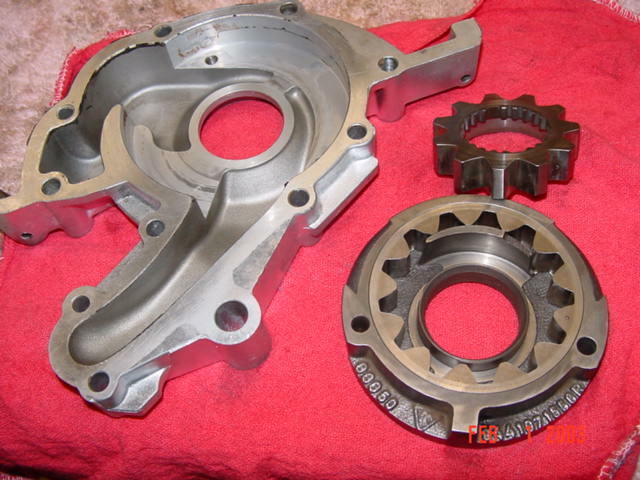 Torque to spec and then use a wet stone to even the mating surface of the oilpump. If I had checked this closer, I could have avoided a serious oil leak and a cheezy epoxy fix. These Porsche oil pumps are expensive but very durable. One more round of washing and this should be ready, Yes, the oil fill separator can be opened, just patience and determination. Here is as good a place as any for a peek at the motor mounts. With so much talk of motor mount problems, I really expected to find something but as hard as I looked I couldn't find anything wrong with these. I'm not sure if these are OEM or aftermarket but the engine runs very smooth with them. Update: here is a link to help with identifying motor mounts. I know, the "aluminum" paint is kinda bright but it will dull under operating temperatures. The high heat paint that I used is not particularly durable - even spilled motor oil will remove it. Oil cooler, balance shafts, oil pump & other hardware coming together. Note: many are brave enough to mount/assemble the oil cooler without using the alignment pin (a special tool to ensure that the cooler housing is mounted straight). If you're thinking you can get by without the tool, (I did) please do your research carefully. If the cooler is not aligned properly, the oil pressure regulator will stick. 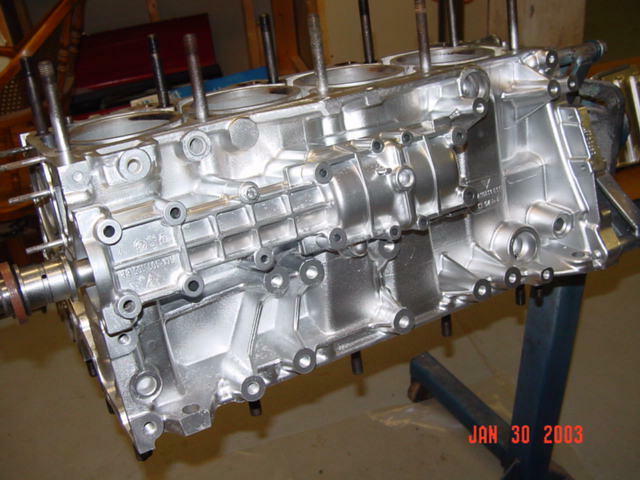 Invariably this problem occurs several months after you have the engine back together and results in high oil pressure. High oil pressure can cause the oil filter or filter seal to burst and lead low oil pressure or even a fire. 2007 Note - Many of these smaller bolts should have been replaced and the small brackets should have been either zinc coated or powder coated. After 2 years, these parts now have an ugly rusted look to them. Surface cut of .004" brings the head deck down to .091". This will be the last time this head can be surfaced and I will need the thicker (1.4 MM) gasket. I got a good price on the machine work ($150 plus $80 for guides) and got lucky that I didn't need valves, seats or springs but the gasket is an additional $85 (ouch). If you're evaluating a head, be sure to check the deck height. About that head gasket: when I ordered my gaskets I could have ordered a set with the thicker head gasket. At that time I didn't even know there were two thicknesses available. So, I'm just about ready to seal up the oil pan, I followed the procedure in the workshop manual for doing this (mostly). I didn't use any kind of sealant and didn't really pay any attention to the tightening pattern, other than to bring the torque up evenly and NOT over-torquing. And, I didn't have any leaks (fingers crossed). If I were to do it again though, I would consider this method offered by a more experienced engine builder. - or Yamabond-4 (not Yamabond-5). remove pan, gasket and all traces of previous sealants. wipe down all mating surfaces on block, gasket and pan with acetone. repeat step #2 until mating surfaces are dull, there should be no shiny reflections. install 4 bolts into oil-pan, aim 2 per side upwards evenly spaced apart, use duct-tape over head to hold in place. apply thin even layer of elephant-snot to pan surface (follow instructions on tube). CAREFULLY lay down pan-gasket onto oil-pan mating surface, try to lay it down perfectly vertically with no sliding around necessary. The bolts help hold the center of the gasket from flopping off. apply thin even layer of elephant-snot to top of oil-pan gasket. apply thin even layer of elephant-snot to bottom of engine. 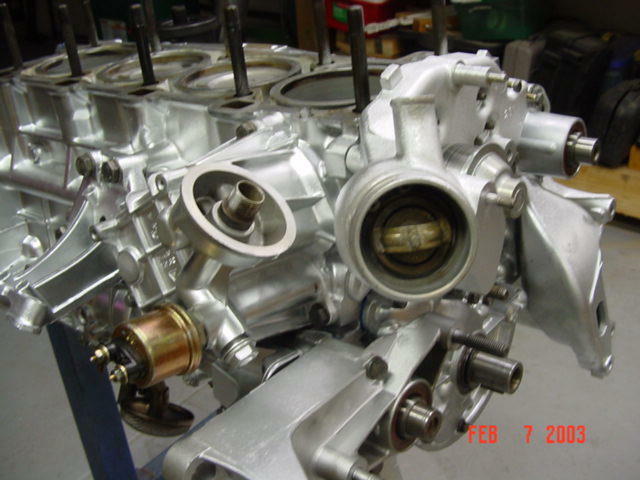 install oil-pan: position oil-pan below engine and to the left (driver side) about 6". Tilt pan at 45-degrees downwards on the right side. 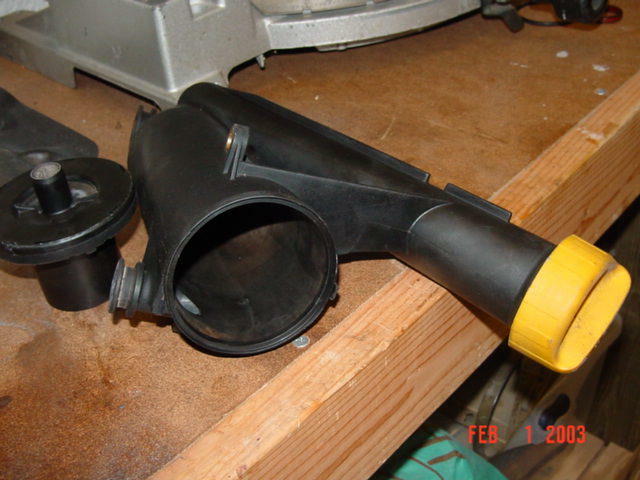 Lift up and slide to the right to clear the oil-pickup tube past the baffle. When pan is centered under engine, raise right side to pan is even with block. The four bolts you taped to the pan should line up with the holes in the block. install bolts #1 & #2 about 5mm into the block to hold pan in place. Remove duct tape and turn in the other four bolts about 5mm. Install rest of bolts about 5mm each. HAND-TIGHTEN in TWO PASSES (no ratchet) all the pan bolts using the 10mm universal-socket and extensions so that the gasket is barely in contact with the block. Use the tightening sequence in the book. Then verify that the thickness of the pan gasket is still the same as the uncompressed thickness. straighten out a metal coat-hanger and bend a 1/4" section at the tip 90-degrees. Use this to verify that the semi-circular section at the front & rear is installed into the pan and not caught up on the edge. 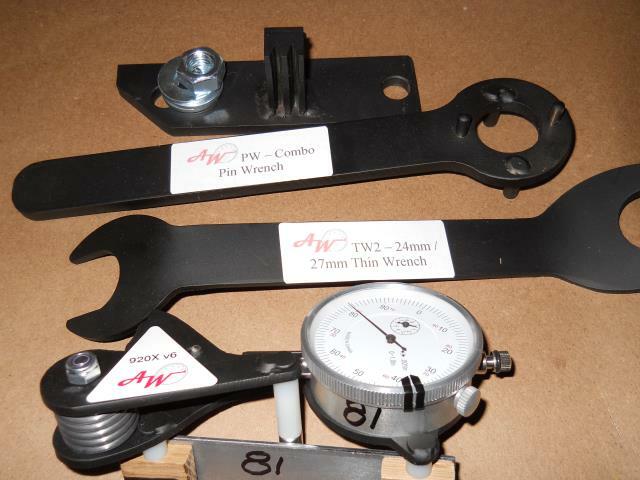 make a THIRD PASS using the 1/4" torque-wrench to 0.5 lb•ft. This should compress the gasket NO MORE than 0.5mm (verify with ruler). This will squeeze out the elephant-snot in little droplets all around the oil-pan. The gasket SHOULD NOT be bulging, sides should be flat. make a FOURTH PASS over the pan-bolts with the 1/4" torque-wrench to 3 lb•ft. Verify that the oil-pan is squeezed evenly all around. It should be at the thickness of the internal spacer-washer. With this procedure, you should be able to drop a 1/4-stick of dynamite down the oil-filler tube and blow out EVERY single seal on the engine, including the rings and the pan-gasket will hold! I've even removed all the bolts and driven the car around under boost to confirm that the sealant holds!